US companies for months bemoaned the tariffs on Chinese imports that will take effect on Friday. Now they fear the worst is yet to come in an escalating confrontation with Beijing over trade. Duties on $34bn of Chinese goods will take effect just after midnight in Washington, President Donald Trump told reporters aboard Air Force One on his way to a rally in Montana on Thursday. China has promised to immediately impose retaliatory duties of a similar size on American goods. The US has also released a list of an additional $16bn in products targeted for tariffs, and Trump suggested the final total could eventually reach $550bn, a figure that exceeds all of China’s annual goods exports to the US. Companies including General Electric and trade groups such as the US Chamber of Commerce say tariffs are the wrong way to address allegations of intellectual property theft by China, and that firms are making contingency plans should a trade war ensue. Some businesses have tried to persuade the Trump administration to back down by saying they’d be left with no choice but to consider reducing production, firing workers and even shifting operations out of the US to account for the added costs from import tariffs. “With tariffs against China taking effect, American consumers are one step closer to feeling the full effects of a trade war,” Matthew Shay, president of the National Retail Federation, said. SEMI, which represents semiconductor companies and others in the manufacturing supply chain for the electronics industry, estimates that the initial round of tariffs will increase costs for its members by between $20m and $35m. The second list of $16bn in goods - which is more heavily focused on technology products - could produce a hit of at least $500m, said Jay Chittooran, a public policy manager for the group. 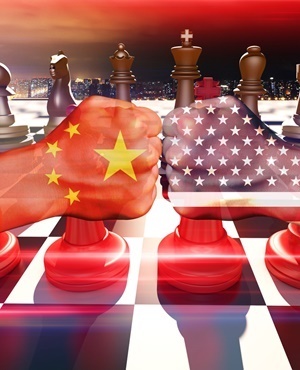 The American Chemistry Council estimates that the second wave of promised tariffs will affect $2.2bn in imports of chemicals and plastics from China and $5.4bn in US exports to China from retaliatory duties, said Ed Brzytwa, director of international trade. The Trump administration did remove some products from an initial tariffs list after companies and businesses groups objected. The goods included electric and cordless snow blowers made by New Jersey-based Snow Joe, said Joseph Cohen, the company’s chief executive officer. But the list of $16bn in goods targeted for tariffs include Snow Joe tillers, garden cultivators and log splitters, and imposing duties only means higher prices for consumers and added cost and uncertainty for businesses, he said. “Tariffs are always a tough thing to look at because unfortunately the consumer does get hurt, business like mine get hurt unintentionally in the process,” Cohen said by phone. Daniel Rogge, the chief executive officer of a closely held metal-machining equipment company in Waunakee, Wisconsin, said he may have to raise prices 5% to 10% to cope with tariffs that kick in Friday on Chinese-made tools for which there’s no US-made equivalent. Tormach, with about 45 employees, sells some computer-controlled milling machines, lathes and other tools subject to the tariffs. “My fear is that all this uncertainty around the Trump administration and the trade war will result in less consumer confidence,” Rogge said. American soybean farmers - including from states that backed Trump in the 2016 election - are being particularly hard hit by the retaliatory duties. China is the top export market for US soybeans, accounting for almost $14bn in sales and representing nearly a third of total US soybean production in 2017, according to the American Soybean Association. Farmers are already feeling the pain with canceled orders and falling commodity prices, without any promised relief, said Max Baucus, a former Democratic senator from Montana and ambassador to China. He’s co-chairperson of Farmers for Free Trade, a non-profit group. “For farmers across the country, the trade war is now getting real,” Baucus said in a statement. General Electric, one the largest US employers and exporters, tried unsuccessfully to have 34 product lines removed from the list of goods targeted for tariffs. The company has said imposing tariffs on products such as aviation and medical parts could hit American operations and jobs - including its Wisconsin-based facilities that employ 6 000 people. “We remain concerned that these tariffs could make it harder for US manufacturers to compete in the global economy, and will shrink rather than expand US exports,” the company said in a statement. Companies and trade groups can submit comments on the list of $16bn in goods targeted for tariffs and appear at hearing set for July 24 in Washington. Still, there aren’t high hopes the administration will change its approach, Brzytwa of the American Chemistry Council said. “There’s a viewpoint that’s shared across the government, and certainly at the White House, that there’s going to be pain that US industry is going to have to suffer in order to change China’s behaviour,” Brzytwa said by phone.